For the man who loves industry, whose professional look has a strong, rugged quality..get him the Suspension money clip! 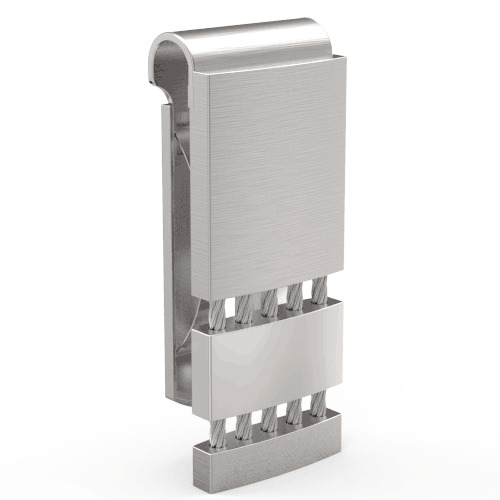 It's made of solid polished stainless steel, with steel cable accents reminiscent of modern suspension bridge cables! The sturdy spring-loaded grip holds up to 25 folded bills, opening and closing easily for adding or removing cash. Add free custom engraving for an extra-special distinctive touch. 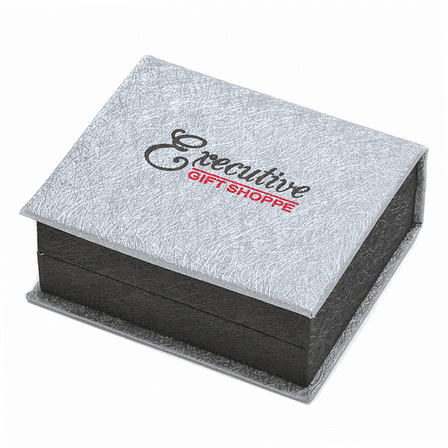 Your money clip will come in a gift box, and will ship within 1 business day. Will this clip hold a couple credit cards securely? Yes, it will. The spring grip allows you to slide credit cards into its hold. How many cards can this clip hold? 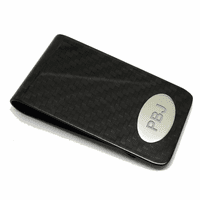 This money clip, and all our spring loaded money clips, can hold 3 to 4 credit cards in addition to your cash. 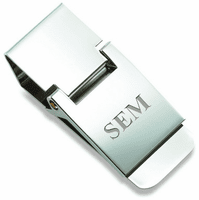 I would like to personalize a money clip but with a simple icon/ logo rather than letters - is that possible? Received this as a gift. The custom engraving adds such a thoughtful touch. When I first looked at it, I thought it seemed more of a show piece. Had some trouble at first getting bills in and out of the thing. Perhaps I have a longer attention span than some of the other reviewers, but after fiddling with the thing for like sixty additional seconds, I realized that the clip is also highly functional. The mechanism is smooth. Might need a little breaking in? Or perhaps I just needed to get the hang of it. I too was nervous about bills tearing at first. If you have that issue with this clip, perhaps it�€™s because your cash is folded three times over? Switch to bifold so that cash encloses your cards and make sure that you�€™re sliding the folded end of the cash into and up against the clip. Hope that makes sense. See attached photo. I�€™ve only had it for about 24 hours. It�€™s classy, but I don�€™t think over the top. And I�€™m not sure how anyone could reasonably claim the thing is too bulky. It�€™s of average width. I hate bulky. This fits comfortably into my back pocket. I don�€™t carry a ton of cash. Right now, 5 bills plus five cards, including ID. I�€™d definitely feel comfortable adding a card or two and more cash. I like this thing so much that I had to review it after seeing the negative critiques previously posted. I�€™m a regular online buyer, but this is the first time I�€™ve ever done a product review�€”that�€™s how strongly I feel about it. One of my all time favorite gifts. I had some problems with the first clip that was sent. The bottom disconnected from the cables. However, Pete from Executive Shoppe worked with me to get a replacement. Way, way, way too bulky. Last thing I need is a bulky money clip and this thing is bulky, even before you put anything in it. Would not recommend and sent mine back. The monogram turned out fine. However, I now can't return the product because of the monogram and it is not what I thought it would be. I don't know how you can put money in there. It's supposed to hold 10-15 bills?? I don't know if that's possible. I can't pull it apart to slide the bills in, there is no hinge to lay them in the clasp. The concept is pretty interesting but the practicality of having a money clip with that much difficulty to put money in is frustrating. 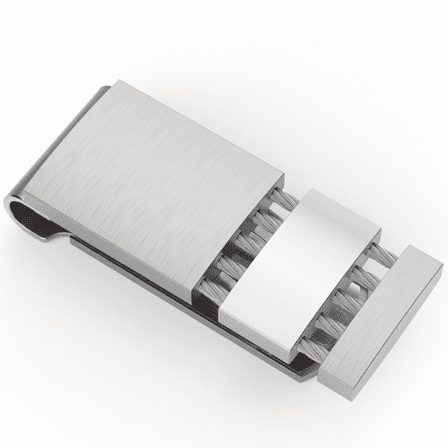 Maybe I just didn't understand what this concept was but to me, this is not an acceptable money clip. Was going to give it to my husband for our wedding--now it just sits in the closet. 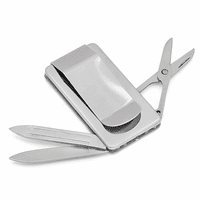 Merchant Response:We're so sorry for any confusion, spring loaded money clips work a little different. You don't open anything up, you just slide the money into it as is. Just take your folded bills and on the open side of the clip you'll push your bills in. The two springs will push your bills up against the top of the clip. Please let us know if this isn't working for you. Also, we want you to be happy with your money clip. If this is broke, or if you just don't like the way it works, you are more than welcome to exchange it for a hinged metal, french fold metal or magnetic closing leather money clip. Please let us know. Overall I like the clip, the only problem I have with it is that the clip is so tight that when trying to insert a few bills (4-5) they tend to tear. This may be do to it being so new and hopefuly it will lossen up after time. Overall i was very happy,just wish i would have gotten different lettering the Vanessa letter C looks more like an e and i had three of them put on.